Firstly, thank you, EVERY ONE OF YOU, for the unbelievably kind, thoughtful and supportive comments, e-mails and text messages you sent my way about my last post. Your kindness has blown me away, and I am ever the more grateful for this space we share. I read each message with sincere appreciation and each one has helped me to heal. Thank you thank you. Secondly, I’m writing this post as I devour yet another slice of this chocolate bread, because it is truly the greatest thing to come out of my kitchen in weeks — maybe even months. Each bite is soft, chewy, full of melty chocolate bits and I cannot stop eating it. I’m about to go in for another slice, if I’m being honest. Thirdly, this recipe comes at a crucial time because, um, I have something to say. As of this Friday, April 1, my husband and I are going to try out the Whole30 program (no fooling). ERRRRRMMMM YEAH. This carb and dessert-loving food blogger is going to take out all carbs, sweets, etc. etc. out of her diet for the next 30 days. I just… don’t even know. But here’s the thing — we’re doing this because we feel like our diets need a bit of a reset, and this program seemed to fit our style best. Elliott still gets to eat all (well, most of) the meats, and I get my fill of fruits and veggies (which I do love, truly) and we are just going to see what happens. But until then, in these next few days, we are clinging onto what we can still enjoy — chocolate, bread, wine and cheese (oh, darling cheese, I will miss you). It’s going to be a rough road but we are DOING IT. ← That’s me psyching myself up for the next month. I’m also crying inside. 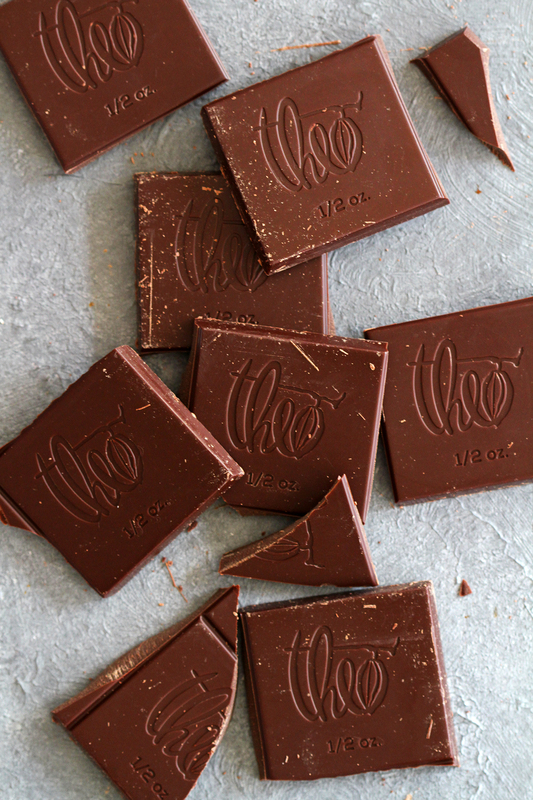 cookbook, a company based in Seattle that makes ah-mazing chocolate. I know this because at the Blog & Bake Retreat I attended a few weeks back, we had a tasting of, like, at least a dozen different flavors and each one was mindblowing. I remember in particular loving the lemon one, and a sea salt one, but really all of them were top notch. And then, on my flight home, I perused the cookbook and found a recipe that includes their chocolate in a bread. I knew right then — I must bake this. And so, I did, albeit weeks later. The results were just what I had hoped for — a soft, chewy loaf studded with melty chocolate bits, ever so lightly sweet but also a bit bitter. One slice fresh from the oven will make your eyes roll back into your head, but what will really take this bread off the charts is when you make it into French toast or slather on some peanut butter or fresh jam. 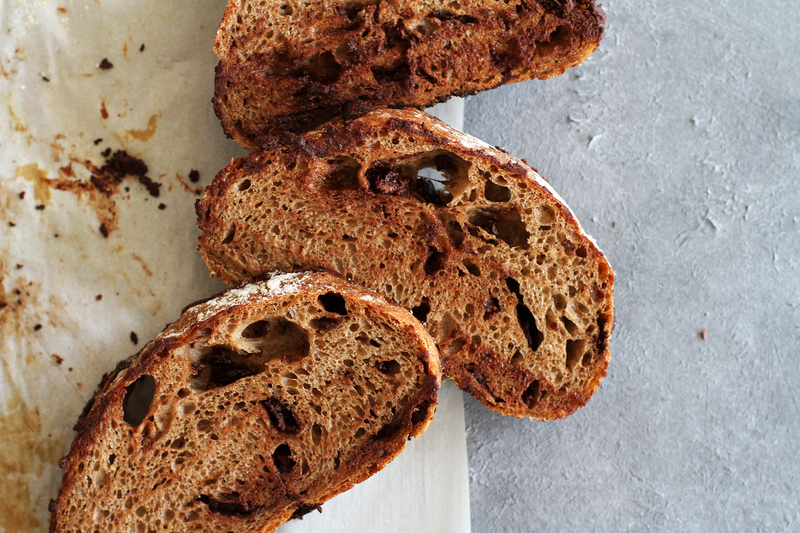 Guys, gals, anyone and everyone — for the love of chocolate and bread, make this recipe as soon as humanly possible. This cannot be stressed enough. 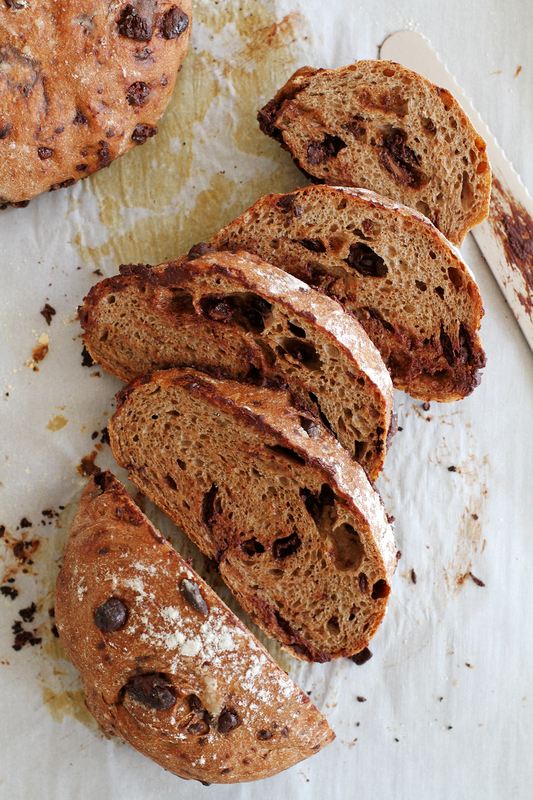 As of Friday, so long, sweet, beautiful chocolate bread. But until then, YUMYUMYUM. In bowl of stand mixer with dough hook attached, stir 3/4 cup bread flour, 3/4 cup whole wheat flour and warm water until combined. Cover and let sit 45 minutes to activate gluten. Add cocoa powder, yeast and xanthan gum. Stir 1 minute at medium speed to combine. Add salt. Stir another minute at medium speed to combine. Add remaining 2 tablespoons bread flour and 2 tablespoons whole wheat flour. Stir, then increase speed to medium-high and mix 2 minutes. Dough will still be sticky, but should start to ball up around dough hook. If not, add more bread flour, 1 tablespoon at a time, and stir thoroughly until dough begins to ball up slightly. Add chopped chocolate in 3 additions, stirring 30 seconds after each addition. 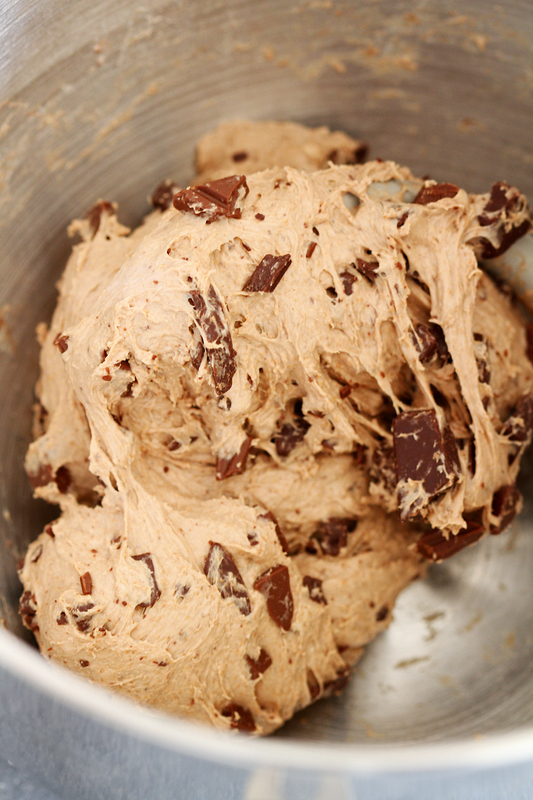 Dough should come together more as you stir in chocolate. Gather dough into rough ball and transfer to large, lightly oiled bowl. Cover bowl with plastic wrap and let dough rise in warm place 45 minutes to 1 hour until doubled. Heat oven to 400 degrees F. Line rimmed baking sheet with parchment paper. Punch down dough and divide into 2 equal pieces. Roughly shape each piece into a ball and transfer to prepared baking sheet. Sprinkle tops of dough with flour and cover with plastic wrap. Let rise in warm place 45 minutes until nearly doubled. Uncover dough and bake 30 minutes until thermometer reads 200 degrees F in center of loaves and loaves make hollow sounds when tapped on bottom. Cool loaves completely on cooling rack before slicing. Disclosure: This post contains affiliate links. A huge virtual hug to Theo Chocolate for providing the cookbook and chocolate that resulted in this recipe! My sweet tooth and I thank you. The chocolate bread looks awesome. Why are you adding xanthum gum to bread? Never seen it used except in gluten free recipes. 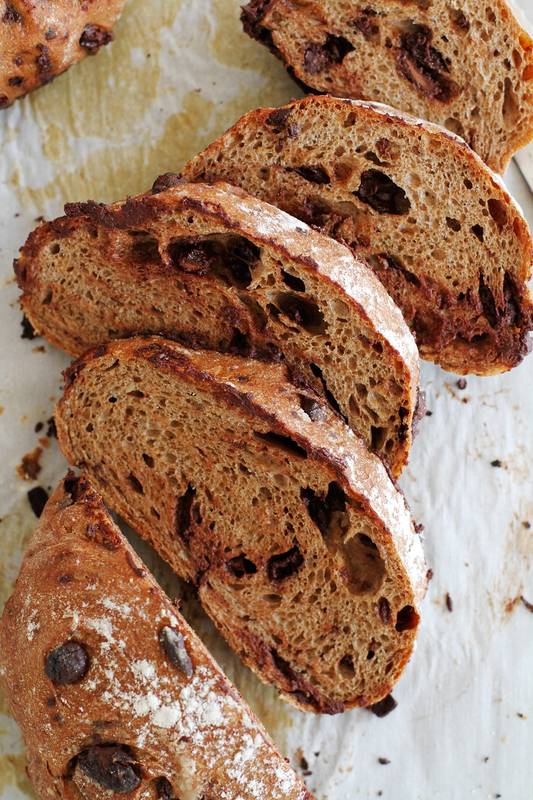 I had never heard of chocolate bread before today…I think it’s fair to say that you’ve changed my life. I’m wondering why this bread needs xanthan gum, an ingredient usually used in gluten free breads. Anne — Excellent question! According to the recipe notes in the cookbook, xanthan gum is used to improve the texture of the crumb. Tonnie — Good question! According to the recipe notes in the cookbook, xanthan gum is used to improve the texture of the crumb. Laura — My jeans definitely hate me right now. 😉 Thanks! 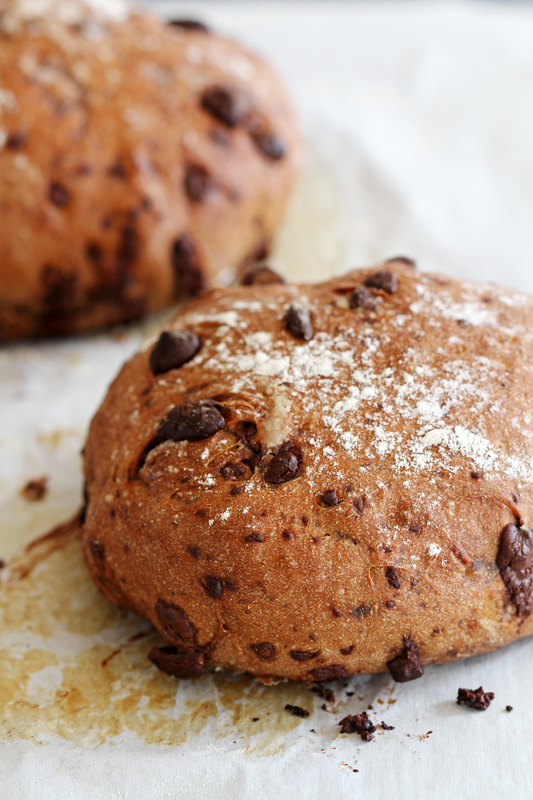 Chocolate+bread= love! This looks amazing! Hhahah crying on the inside. You can do it! Especially if you eat this until thursday at 11.59pm 🙂 Keep us posted on the month. I’ve been thinking of Whole30 for a while now but will have to wait until the baby weans to do anything drastic to my diet. But gosh do I need a reset. Zainab — That is EXACTLY how I feel (only Avery’s been weaned for, like, a year. Ahem). I’ll definitely post updates, if for no other reason than to help keep me accountable from raiding the chocolate stash in our house in a moment of weakness ;). That looks like a very nice treat. Good luck with the Whole 30. I have done it and really liked it. As a French woman I was very surprised how little I missed bread and cheese. Commit to it and do it! Moi — That is encouraging! I think I can survive 30 days without bread and cheese (I hope ;)). Because why would you NOT add chocolate to something if you could? Love it! I’d never heard of Whole30 until reading this, but I’m intrigued. God help me, I’m going to start it next Friday. And when it’s over, I’ll be making some chocolate bread. Yum! Where can you buy the xanthan gum at and how much does it cost? I would love to try this bread!! Teresa — You can buy it at most grocery stores in the baking/gluten free section! I know Hodgson Mills sells it in packets. Thanks for posting this! I can’t wait to try it. This may be a silly question, but is a stand mixer necessary? I don’t own one but really want to make this! I haven’t made bread from scratch before, would hand mixing be okay or how would I go about mixing without the stand mixer? Thank you very much in advance!